At Proctor Elementary School, drivers are now alerted to pedestrians in the crosswalk across Redwood Rd by flashing beacons! 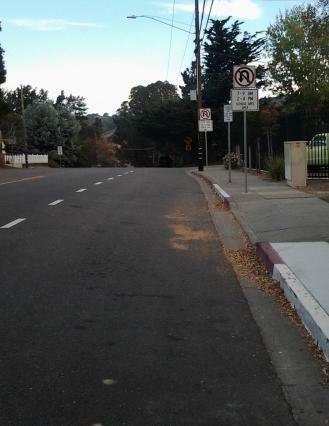 Alameda County Public Works Agency (PWA) installed the new “Rapid Flashing Beacons” that are clearly visible from a long distance. Most importantly, they are visible long before a driver can see the crosswalk itself! And, they are also visible at night. This has already greatly improved the safety for students and all pedestrians, including times when there is no crossing guard on duty. Additionally, if you have driven up Redwood Road to Proctor Elementary School recently, you may have seen the new No U-turn signs in the northbound direction between the two ends of Proctor Road. No more dangerous U-turns at these intersections! U-turns have been a constant safety hazard during drop-off and pick-up times. Drivers making U-turns have often cut into the path of drivers turning into Redwood Road, or even endangered pedestrians in one of the Proctor Road crosswalks. U-turns on Redwood Road at Proctor Road simply aren’t safe during the chaos of school drop-off and pick-up. And there is no need for it, as there is plenty of room to make U-turns after the intersection with Proctor Road towards the golf course! Unfortunately, U-turns in front of the cross walk are still allowed. The Proctor School community is still waiting for two additional safety features. PWA has secured Federal funding for “bulb-outs” on either end of the crosswalk across Redwood Road at the school. A bulb-out is a rounded extension of the sidewalk into the road a few feet, which shortens the crossing distance and prevents cars from parking too close or even into the crosswalk. PWA has assured us they will be installed during the current school year. We have also made a request for speed display signs along Redwood Road, alerting drivers of their speed and of the existence of the school.